Description: The Wolff-Kishner is a reaction for converting carbonyls (such as ketones and aldehydes) into alkanes. Notes: NH2NH2 is called “hydrazine”. The imine of hydrazine is called a “hydrazone”. Mechanism (hydrazone formation): The reaction begins by 1,2-addition of the nitrogen on the carbonyl carbon (Step 1, arrows A and B). This is followed by transfer of a proton from the nitrogen to the oxygen (Step 2, arrows C and D) and then 1,2-elimination of hydroxide (Step 3, arrows E and F). 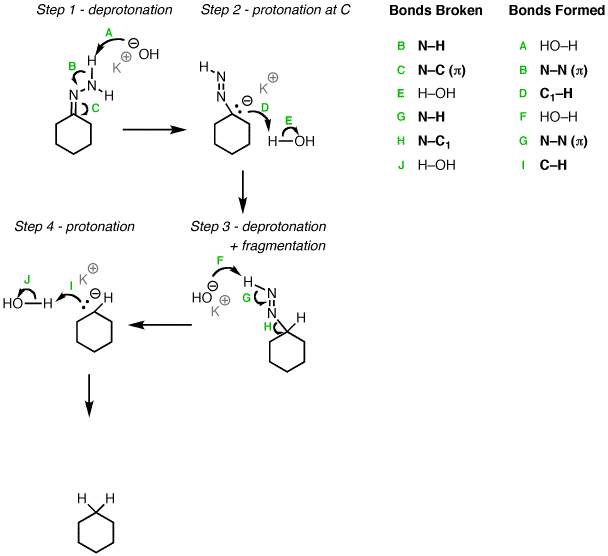 Finally the hydrogen is removed from the nitrogen in an acid-base reaction (Step 4, arrows G and H). Water is a byproduct here. Acid can be used to facilitate this reaction. 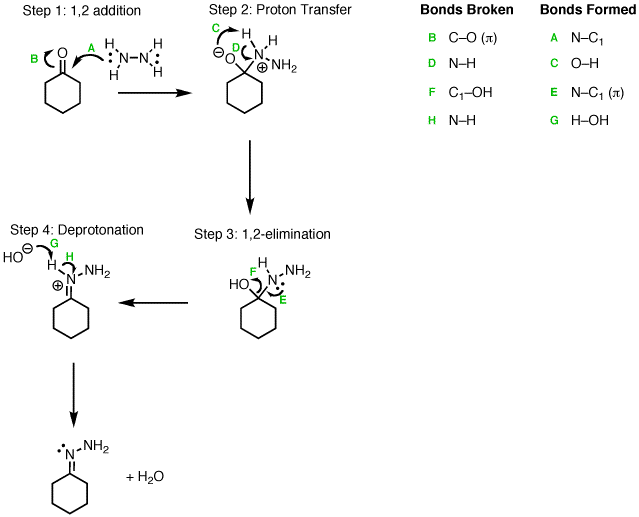 There are other reasonable bases that can be used to remove the proton in step 4. The hydrazone is deprotonated by OH and the negative charge moves to the carbon (Step 1, arrows A, B, C) which is protonated (Step 2, arrows D and E), whereupon the nitrogen is deprotonated again, and nitrogen gas (N2) is lost (Step 3, arrows F, G, and H). This leaves an anion which is then protonated to give the alkane (Step 4, arrows I and J). Notes: Ethylene glycol is also a reasonable acid to use in the last step. Potassium (K) is not crucial here, it’s just a spectator ion. Also note that KOH here is catalytic. does this reduce alcohols to alkanes too? Yes, but for a Wolff-Kishner reaction that does not imply the use of a strong base (i.e. hydroxide), would water be able to deprotonate that amine in step one to give the N-N double bond? I ask because in the synthesis of the drug Amiodarone, they do not specify basic conditions. Rather, they allude that they use hydrazine hydrate only. Water isn’t basic enough to deprotonate. The pKa of the hydrazone hydrogens is about 22, whereas that of H3O(+) is -2. The equilibrium would be 24 orders of magnitude in opposition to the desired reaction. Although they don’t specifiy basic conditions in the reaction scheme, it’s not uncommon to leave out details such as base, solvent and heat. The Wolff Kishner is generally a very unfavorable reaction as it is – it requires heating at 180 degrees C or more – so I am nearly 100% certain that they merely omitted writing base in the scheme here. And what is a role of ethylene glycol in this reaction? The site is really great. Ethylene glycol serves as a solvent here. It has a very high boiling point (~200 degrees C); the fact that the reaction needs to be heated so much is why this solven tis used. Good question. One reason I’ve read is the greater strength of the C-O (pi) bond as opposed to the C-C (pi) bond. I’m not sure this is the whole picture but it is at least a component. nice presentation. Can we use potassium carbonate and ethylene glycol and temperature ~200 degree C? I suppose you could use potassium carbonate but it will not deprotonate ethylene glycol irreversibly; at 200 degrees C, however, the reaction should still proceed well. In the Wolff kishner we first convert ketone or aldehyde to hydrazone. Hydrazone formation is done in acid medium. Now if we have a carbonyl compound with an Acetal and Ketone, will the acetal be also reduced in Wolff kishner due to equilibrium being established in during hydrazone formation (acid medium form ketone and ketone formed along with original one will react to form two Hydrazone sites, which can be reduced in proceeding step with strong base. Couldn’t find any answer to this. Acetal hydrolysis requires aqueous acid. Hydrazone formation is done using anhydrous acid. So the acetal should be unaffected by these conditions. It really makes sense, low H2O – complete acetal side of equilibrium. Thanks from saving me from a headache. And great site. Wolf kishner reaction possible in carboxylic acids or not? No, strong base deprotonates the carboxylic acid, it’s too difficult to form a hydrazone on that species. 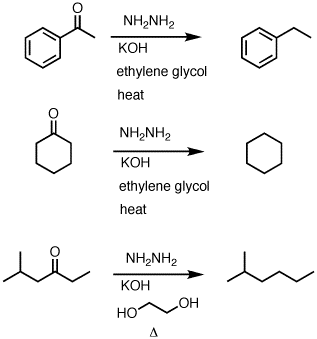 Would this mechanism be the same for aromatics? Yes, it would work exactly the same way for aromatic and non-aromatic ketones. oh- a bad l.g can leave because it’s a catalyst? My professor won’t allow us to transfer Protons intramolecularly….. Do you know why is that…..? Probably because the acid and base need to be able to reach each other, which is generally not possible unless they are 5 or 6 atoms apart. So I would use an external base / external acid to perform the proton transfer. In fairness that is probably a better way to do it, but it takes forever to write out. My approach is a bit of a short cut. Does it will just reduce ketone group only or will react will acid group also? Not going to work well with a free carboxylic acid there.